Purpose: The aim is to evaluate the outcome and compare the stability with two-time use of platelet-rich growth factor (PRGF) versus one-time use of PRGF in immediate placement of dental implant in infected socket. Materials and Methods: This study comprised placement of immediate implant in infected sockets in 100 patients with two-time use of PRGF (Group B) versus one-time use of PRGF (Group A). Proper administration of antibiotics, careful debridement of the socket, and meticulous suturing were done in every case. In Group A, it was placed at the time of immediate implant placement. In Group B, it was placed twice: at the time of placement of implant and 1 month after placement of implant. Clinical assessment of pain and swelling was done. Stability was assessed by radiofrequency analyzer immediately after placement and at follow-up of 2 months and 3 months. Results: The stability of implants with two-time placement of PRGF was more than that with one-time placement of dental implant. All except 14 implants osseointegrated in this study. There was significant decrease of pain and swelling in both the groups from day 1 to week 1 and was nil by 12 weeks. Conclusion: It can be concluded that placement of immediate implant in infected socket with two-time use of PRGF is an effective and better alternative for rehabilitation. However, more studies with longer follow-up and large number of patients are needed to confirm the results of this study. Extraction of tooth results in loss of alveolar ridge height and width. This resorption is more during first 6 months after tooth extraction, although it continues for lifetime. This ridge resorption compromises the favorable positioning of dental implants. Currently, immediate placement of dental implants into fresh extraction sockets is considered to minimize resorption., There are various advantages of immediate placement of dental implants which includes decreased number of surgical interventions, decreased healing time, and improved maintenance of alveolar architecture. Plasma rich in growth factors has been proposed to enhance osseous regeneration. It is derived from autologous blood by sequestering and concentrating the platelets by centrifugation. Platelet concentrations can enhance wound healing by releasing abundant growth factors and stimulating several biologic functions such as angiogenesis, proliferation, and differentiation. 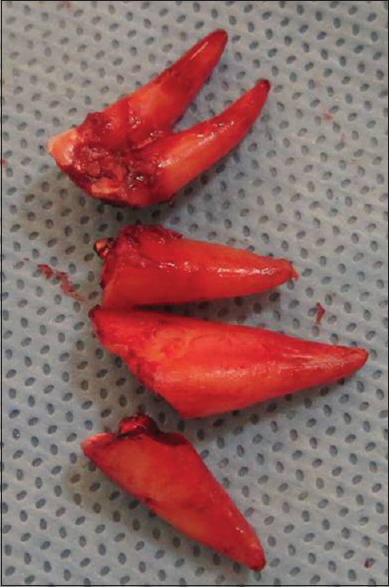 The use of autologous platelets improves early bone apposition around implants and thus facilitates osseointegration. However, there is lack of sufficient evidence in relation to platelet-rich growth factor (PRGF) and acceleration of osseointegration. 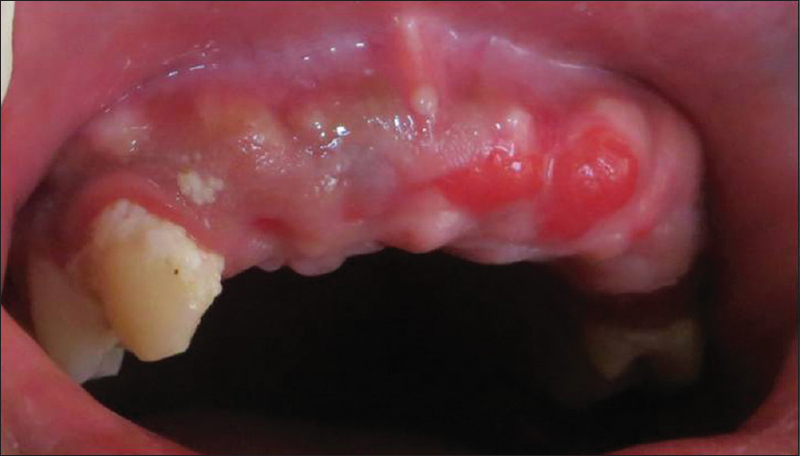 The aim of this study was to compare the stability with two-time use of PRGF versus one-time use of PRGF in immediate placement of dental implant in infected socket. 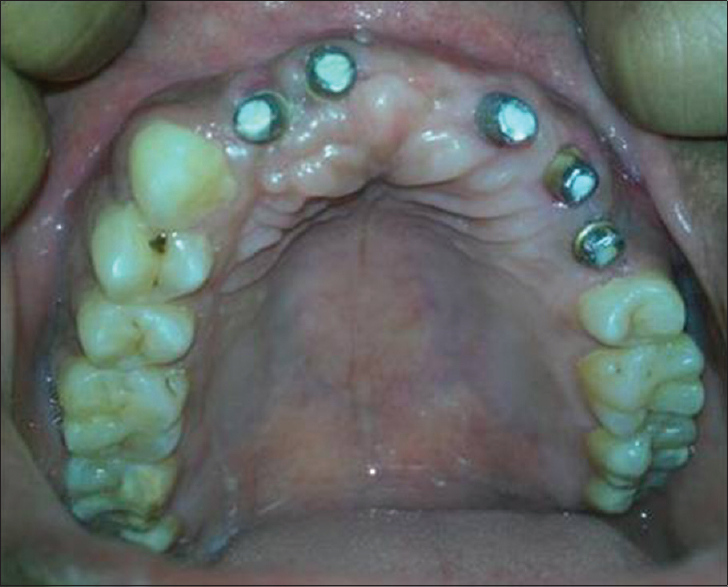 The present study comprised placement of immediate implant in infected sockets in 100 patients with the adjunct of PRGF. Ethical approval was obtained from the institutional ethical committee. Informed consent was obtained from all patients. Patients in need of extraction of one or more teeth with chronic periapical infection of endodontic or endoperiodontal origin as determined by clinical and radiographic evaluation; age older than 18 years and with no general medical contraindications for oral surgical procedures were included in the study. The exclusion criteria included any disease, condition, or medication that might compromise healing and osseointegration. Patients with pathological changes in the jaw bone, chronic rheumatoid disease, patients on steroids for more than a month in a year, or with severe disease with life expectancy less than a year were excluded from the study. In addition, patients not willing to give consent were not included in the study and patients unwilling to return for follow-up visits were also excluded from the study. Patients were evaluated on the basis of history, clinical examination, and radiological investigation. Group B (active comparator): 50 patients received two-stage endosseous implant with PRGF at the time of placement and after 1 month of immediate placement of dental implant. 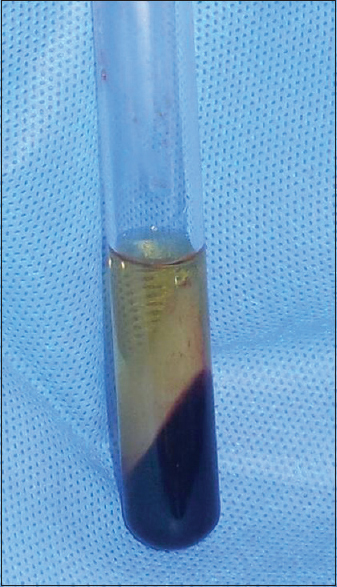 Before the surgery and administration of local anesthesia, 8 ml of peripheral blood was drawn and collected in two autoclaved tube containing 2 ml of 3.2% of sodium citrate. The tubes were centrifuged at 270 g in a centrifuge unit specifically designed for use of this technique. This allows the separation of blood into distinct layers: A cellular layer at the bottom, platelet-rich plasma in the middle, and platelet-poor plasma at the top [Figure 1]. The cellular components (mostly red blood cells and a thin layer of white blood cells) remain at the bottom of the tube, above which is the plasma component consisting of PRGF and finally a layer of plasma poor in growth factors. The middle layer was collected and stored in a sterile glass container until use. Leukocytes were not collected in this preparation. A preoperative orthopantomogram was taken [Figure 2]. The surgical procedure was performed under local anesthesia (2% lignocaine hydrochloride with 1:200,000 adrenaline). After reflection of full-thickness mucoperiosteal flap (if required), atraumatic extraction was performed with the help of forceps, periotome, endodontic files, etc. After extraction, curettage was done with excavator or small curette. Socket was inspected for any pathology, loose fragment of tooth, or loss or fracture of bone [Figure 3] and [Figure 4]. The osteotomy procedure was then initiated with the pilot drill of 2 mm in diameter and osteotomy length was extended 2 mm beyond the apex of tooth, then sequential drilling procedure was carried out. After preparation of the osteotomy, implant was dipped into PRGF after which it was torque into osteotomy site and to final position [Figure 5]. The remaining gap was filled with PRGF and bone graft (if needed). Mucoperiosteal flap was repositioned and sutured passively. Postoperative instructions were given. Patients were discharged after prescribing antibiotics and analgesics. Oral hygiene instructions were given. In Group B patients, PRGF was also placed after 1 month of placement of the endosseous implant. Stability was checked in both groups by radiofrequency analyzer (RFA) [Figure 6] and [Figure 7]. After a healing period of 3 months, the second-stage surgical procedure was performed with placement of healing abutment [Figure 8] prosthetic rehabilitation was done in all the patients [Figure 9] and [Figure 10]. Postoperative assessment of pain, swelling was done. 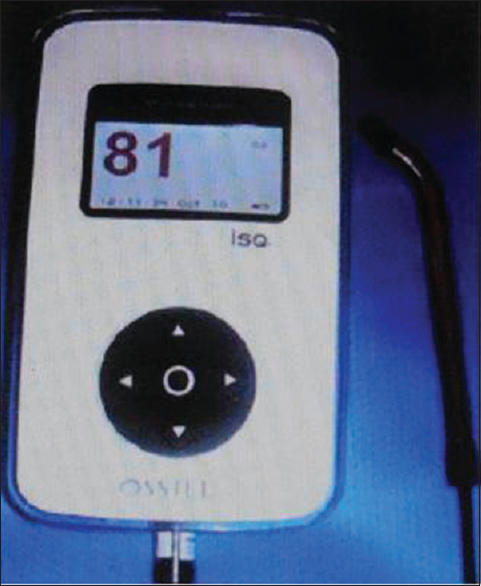 Assessment of pain was done by visual analog scale (0–10) and stability was assessed by RFA (Ostell, ISQ). Statistical analysis was done using SPSS 16.0 version (Chicago Inc., USA). A total of 100 patients were included in the study, of which 63% were male and 37% female. Of 100 patients included in the study, maximum were in the age group of 18–35 years (46% in Group A and 54% in Group B), followed by patients in age group of >50 years (28% in Group A and 16% in Group B). Implants were placed both in the maxilla and mandible. Fourteen implants failed to osseointegrate in this study. There was significant decrease in pain from day 1 to week 1 in both Group A and Group B and was nil by week 12. There was decrease in swelling in both groups from day 1 to week 1 and was nil by week 12. Implant stability was assessed at baseline, 2 months, and 3 months. The difference between implant stability between both groups was clinically significant at 2 months and 3 months postoperatively [Table 1], with increase in stability in Group B compared to Group A. Marginal bone loss was also assessed. 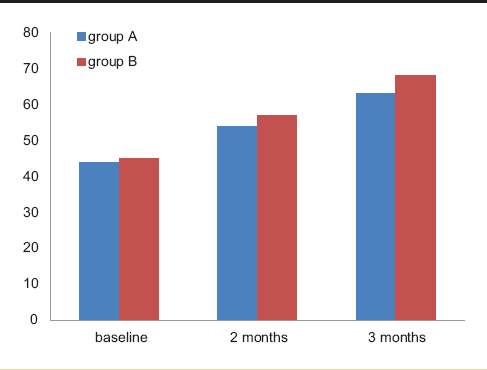 There was less marginal bone loss in Group B compared to Group A at follow-up of 3 months and 6 months. Placement of implants in infected sockets with periapical pathology was cited to be a reason for implant failure.,, Novaes and Novaes stated that the placement of immediate implants in chronically infected sites may not be contraindicated if surgical protocol of antibiotic administration, meticulous cleaning, and alveolar debridement is performed. Lindeboom et al. also evaluated the success of immediate implants in periapical infected sites and showed a success rate of 92%. In this study also, appropriate surgical protocol was followed. Administration of antibiotics, thorough debridement and irrigation of the socket was done in every case. Care was taken in meticulous and passive suturing. PRGF have been used to facilitate for bone and tissue healing and for bone regeneration around implants. The biologic properties of PRGF exploit the potential of severe autologous platelet-derived growth factors obtained with a simple centrifugation procedure to specifically stimulate several biologic functions such as angiogenesis and proliferation. 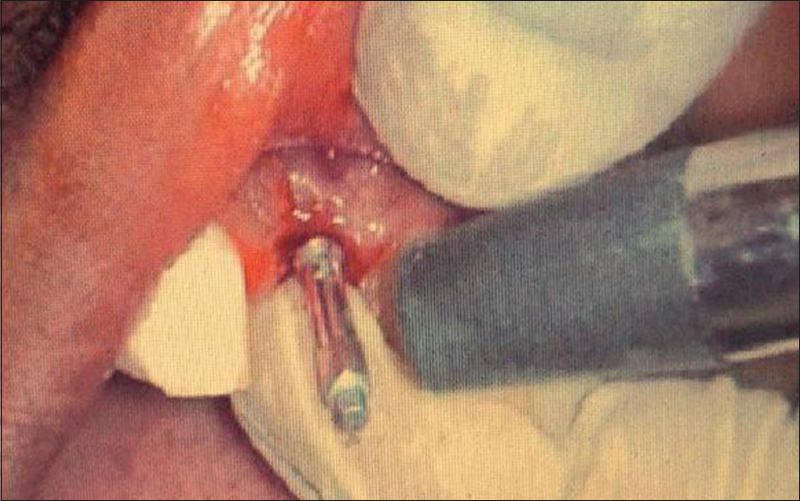 PRGF could be particularly indicated for immediate postextraction implants. It could fill the gap between the implant surface and socket walls when combined with bone chips and function as osteoconductive, autologous bone graft., Histomorphometric analysis of bone implant surface performed after 8 weeks in goats showed that the implant surface adsorbed the protein-rich material and osseointegration was enhanced when surface was covered with PRGF. The study aims to compare the stability with two-time use of PRGF versus one-time use of PRGF in immediate placement of dental implants in infected socket. Del Fabbro et al. evaluated the clinical outcome of implants placed immediately into fresh extraction sockets of teeth affected by chronic periapical pathology using PRGF as an adjunct and considered it to be safe and effective treatment option for rehabilitation. In this study also, the difference in stability was significant between two groups. There was increased stability with two-time use of PRGF; at time of placement and 1 month after placement of dental implant at 3 months than with one-time use of PRGF at the time of placement of dental implant. Marginal bone loss was also less with two-time use of PRGF than with one-time use of PRGF. Pain and swelling decreased in both the groups from day 1 to week 1 and was nil at 12 weeks. No additional complications were noted. Thus, it can be concluded from this study that placement of immediate implant in infected socket with use of two-time PRGF is a safe and effective alternative for rehabilitation. However, the results of this study need to be confirmed over a longer follow-up and with a larger number of patients. Jahangiri L, Devlin H, Ting K, Nishimura I. Current perspectives in residual ridge remodeling and its clinical implications: A review. J Prosthet Dent 1998;80:224-37. Lang NP, Brägger U, Hämmerle CH, Sutter F. Immediate transmucosal implants using the principle of guided tissue regeneration. I. Rationale, clinical procedures and 30-month results. Clin Oral Implants Res 1994;5:154-63. Rosenquist B, Grenthe B. Immediate placement of implants into extraction sockets: Implant survival. Int J Oral Maxillofac Implants 1996;11:205-9. Paolantonio M, Dolci M, Scarano A, d'Archivio D, di Placido G, Tumini V, et al. Immediate implantation in fresh extraction sockets. A controlled clinical and histological study in man. J Periodontol 2001;72:1560-71. Quirynen M, Gijbels F, Jacobs R. An infected jawbone site compromising successful osseointegration. Periodontol 2000 2003;33:129-44. Crespi R, Capparè P, Gherlone E. Fresh-socket implants in periapical infected sites in humans. J Periodontol 2010;81:378-83. Hee HT, Majd ME, Holt RT, Pienkowski D. Better treatment of vertebral osteomyelitis using posterior stabilization and titanium mesh cages. J Spinal Disord Tech 2002;15:149-56. Liljenqvist U, Lerner T, Bullmann V, Hackenberg L, Halm H, Winkelmann W. Titanium cages in the surgical treatment of severe vertebral osteomyelitis. Eur Spine J 2003;12:606-12. Anitua E. The use of plasma-rich growth factors (PRGF) in oral surgery. Pract Proced Aesthet Dent 2001;13:487-93. Anand U, Mehta DS. Evaluation of immediately loaded dental implants bioactivated with platelet-rich plasma placed in the mandibular posterior region: A clinico-radiographic study. J Indian Soc Periodontol 2012;16:89-95. Lazzara RJ. 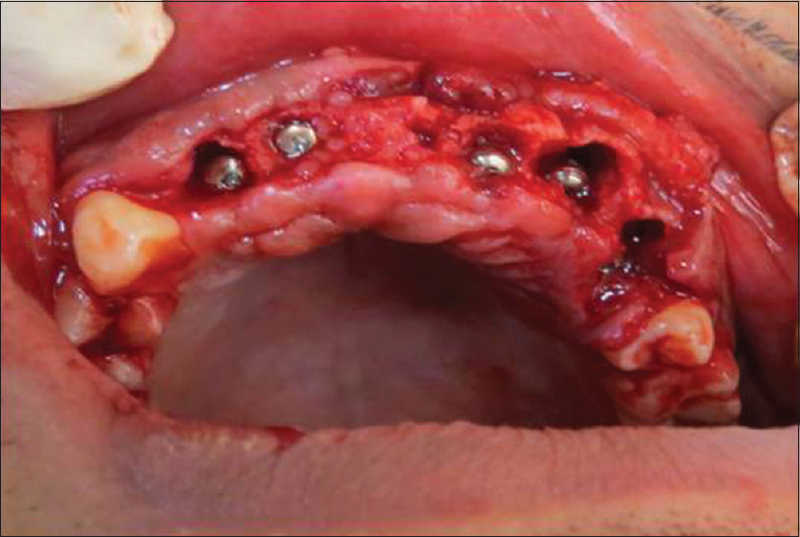 Immediate implant placement into extraction sites: Surgical and restorative advantages. Int J Periodontics Restorative Dent 1989;9:332-43. Kan JY, Shiotsu G, Rungcharassaeng K, Lozada JL. Maintaining and attenuating periodontal tissues for aesthetic implant placement. J Oral Implantol 2000;26:35-41. Bartee BK. Extraction site reconstruction for alveolar ridge preservation. Part 1: Rationale and materials selection. J Oral Implantol 2001;27:187-93. 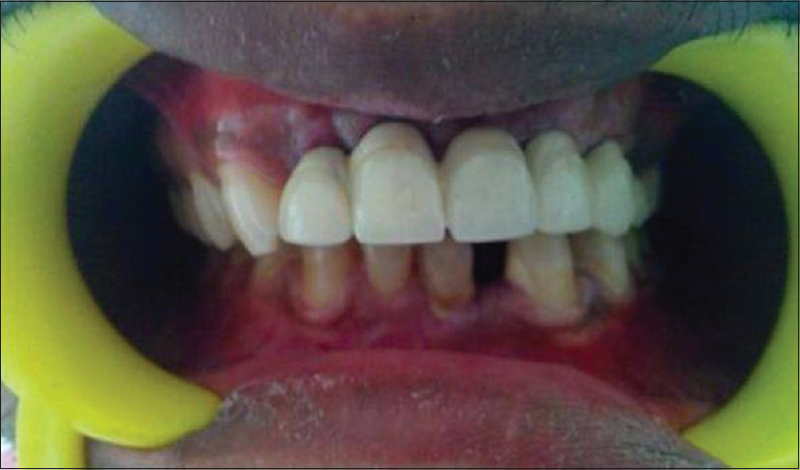 Yang J, Lee HM, Vernino A. Ridge preservation of dentition with severe periodontitis. Compend Contin Educ Dent 2000;21:579-83. Novaes AB Jr., Novaes AB. Immediate implants placed into infected sites: A clinical report. Int J Oral Maxillofac Implants 1995;10:609-13. Anitua E, Sánchez M, Orive G, Andía I. The potential impact of the preparation rich in growth factors (PRGF) in different medical fields. Biomaterials 2007;28:4551-60. Anitua E, Sánchez M, Nurden AT, Nurden P, Orive G, Andía I. New insights into and novel applications for platelet-rich fibrin therapies. Trends Biotechnol 2006;24:227-34. Anitua E, Orive G, Pla R, Roman P, Serrano V, Andía I. The effects of PRGF on bone regeneration and on titanium implant osseointegration in goats: A histologic and histomorphometric study. J Biomed Mater Res A 2009;91:158-65. Del Fabbro M, Boggian C, Taschieri S. Immediate implant placement into fresh extraction sites with chronic periapical pathologic features combined with plasma rich in growth factors: Preliminary results of single-cohort study. J Oral Maxillofac Surg 2009;67:2476-84.